Every once in a while a new home beer brewing product comes out that catches my eye and the Trub Trapper is one of them. So what is the Trub Trapper and why should you care? Well, lets start by talking a little about trub first. Trub is that thick sludge left at the bottom of your boil kettle after you have transferred your wort to the fermenter. It is a combination of hops, compounds, proteins and solids left over after the boil. The problem is that it is very difficult to stop the trub from passing in to your fermenter. Trub formed during the boil can adversely affect fermentation and produce undesirable flavors and haze in your finished beer. It is something that you want to avoid if at all possible and I will explain further in a couple of paragraphs. You worked to remove these unwanted compounds and byproducts during the boil so do not allow them in your homebrewing fermenter. Professional brewers do all they can to make sure trub stays out of their fermenters and thanks to the trub trapper, now you can too! So how does the trub trapper work? 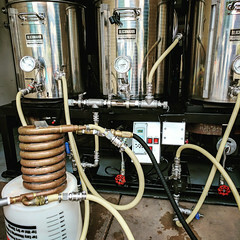 It is pretty simple really, you just place the TrubTrapper in the bottom of your home brewing kettle so that your brew kettle dip tube is outside the tub trapper ring before you fill your boil kettle. 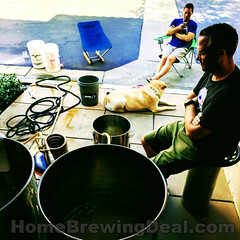 You conduct your boil as you normally would and then whirlpool post boil. Let the wort settle for approximately 10 minutes and you are ready to go. It is that simple. The high temperature soft silicone gasket and overall weight of the TrubTrapper will keep it in place during the boil and whirlpool so there is no need to re-position, or try and unclog anything. A small amount of the overall trub will settle outside the trub trapper filter ring during the whirlpool process, and a portion of that will flow in to the fermenter but the grand majority of the trub will be trapped inside the trub trapper which is exactly where you want it. 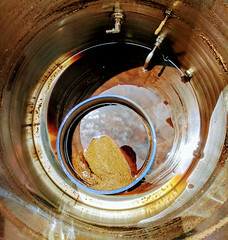 So why is trub transferring in to your fermenter such a bad thing? Well, excessive trub can coat yeast membranes impeding transport in and out of the cells which encourages metabolic by-products. Not to mention tannins and other fine particulates in trub can lead to haze formation in your finished beer. Trub can also be responsible for head retention issues, impact aroma, flavor stability and off flavors such as sulfur, harsh bitterness and soapy notes. If you have been experiencing any of this in your home brew then the trub trapper may be exactly what you are looking for. 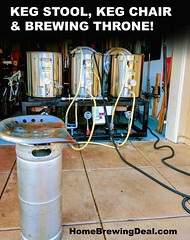 If you like to reuse your homebrewing yeast, the trub trapper can help with that too. Excessive trub affects your ability to harvest and re-use yeast effectively and efficiently. High trub levels make it more difficult to collect and clean the yeast and poor yeast health caused by excessive trub eliminates the ability for you to maintain the quality of your yeast which impacts the quality of your beer! So how much is it and where can I get it? It runs for about $50 and you can find the Trub Trapper here! This certainly would make transferring a lot easier for me.